For as long as Levant has been in business, a long-standing goal of ours has been to give back to our community and help it develop into something even bigger and better. We’ve grown our business thanks to the support and aid of our community, which is why we love to help local nonprofit organizations in a variety of ways, from discounts on our services to acting as a mouthpiece for their cause. 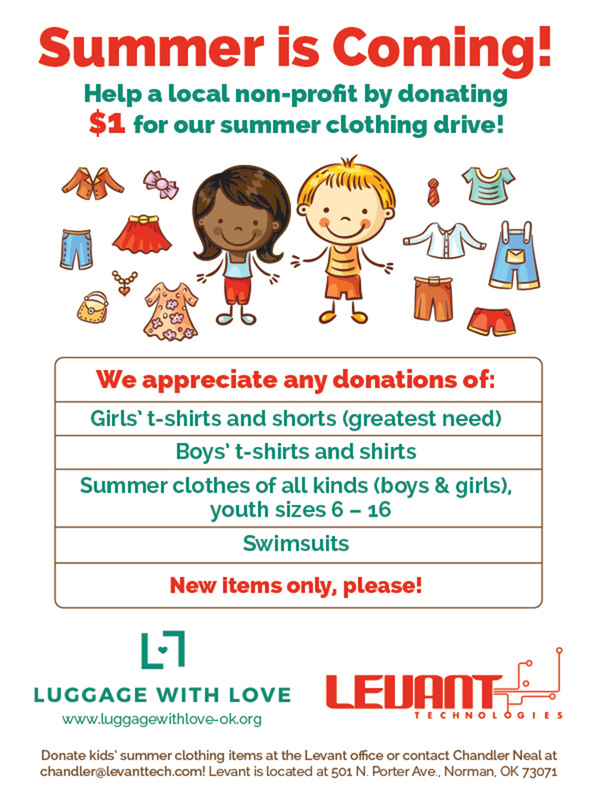 This clothing drive is hugely important to both Levant and Luggage with Love. Any help is greatly appreciated and we encourage you to give tons of outreach and support to this wonderful organization. Levant Technologies, LLC is an Oklahoma custom website design and OKC app development firm. Levant currently has over 500 website clients across the United States, as well as a growing market of Mobile Websites and iPhone/Android Apps for Smartphones, Android Tablets, and iPads. Our business has grown over the last 14 years by providing fair pricing with extraordinary customer service. Levant Technologies is the 2017, 2016, 2015, 2014, and 2013 #1 Best Web Design & Web Services Company, as voted by the OKC Biz Magazine and published in the Oklahoma Gazette, five years in a row. We would be honored to consult with you and learn more about your needs. Call 405-329-9997 anytime for a one hour free meeting with our expert website staff.